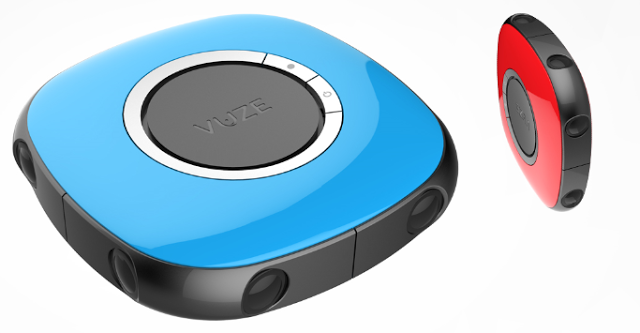 The Vuze Camera aims to be the first 360-degree 3D camera available to consumers﻿. It uses 8 cameras in a flat configuration to provide a full photosphere in 3D. The Vuze is capable of taking both photos and videos, either in 2D or in 3D. The video resolution will be 4k at 30 fps (H.264 format). The company posted sample 3D 360 videos on its website in anaglyph (red-cyan) format. However, you can use the included VR Headset to play the 360 videos in stereoscopic 3D format. The Vuze is relatively compact, about the size of your palm. It has a simple interface with only one button. It can be controlled with an iOS or Android smartphone with realtime preview. However, the videos need to be processed on a desktop for viewing and sharing. It uses removable MicroSD storage. A 64GB card can store 1 hour of video. Vuze Studio, a full-featured desktop video editing software, with 3D effects, audio and titles. The VR kit is projected to be below $1,000 for pre-orders. The company expects to take pre-orders starting in March 2016, with delivery in Q3 of 2016.